A number of our customers have asked if the awesome interior design photos we use in our articles and social media are really created in RoomSketcher. They are! And you can create great 3D interior design photos of your design projects too with RoomSketcher Home Designer. Here’s how! Have you ever noticed that professional photographers always use a tripod? This isn’t just to hold the camera steady. It’s also to shoot the room from an optimal height, which is lower than you think. Interior design photos should show some floor and some ceiling. If the camera is set too high, the photo will be dominated by the ceiling. Set it too low, the photo will be all floor. To create a balanced image, set your camera height in Properties to be approximately half the height of the room. For example, if the room is 8’ (250cm) high, set the camera height at 4’ (125cm). Once you have set your camera height, you can also adjust the camera angle. Use the angle adjustment to capture a little more detail on the ceiling or the floor. We find that most 3D interior design photos look more natural with a slight angle downward. This replicates how we tend to view rooms. One of the best ways to capture the interior design of a room is to shoot it at an angle, from either a corner or the entry point of the room. Place the camera tool in each of these locations on your floor plan and take a quick Snapshot to find the best view point. Avoid aiming the camera directly at the opposite corner. Instead, rotate the camera tool slightly so the corner of the room is off to one side. This will give your room view a sense of movement and openness for a more dynamic photo. The human eye loves symmetry and focal points. To create clear 3D interior design photos you want to set up focal points. You can create photos with a single focal point OR set up three to create a triangular pattern. This helps the viewer to focus and take in the whole image. You can use architectural details, fixtures, furniture, accessories and even color to create focal points in your photos. Room image with a single focal point. Although the seating is not centered in the room, the photo still captures both the room symmetry and seating symmetry by being shot at an angle. Room image with focal point triangulation. The chandelier, tub and chair create three focal points. This photo uses both color and accessories help reinforce these. Take wide angle shots to show the full room and all its elements. Or narrow the aperture on the camera tool to take detailed close ups to showcase materials and textures in your designs. When presenting an interior design, it’s always good to show both wide angle images and detailed close ups to convey the full scope of your design. 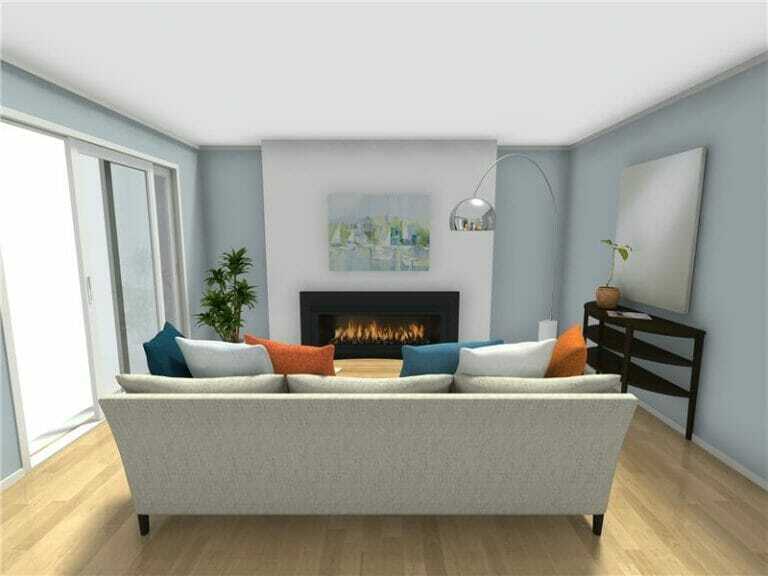 These 3D interior design photos were all created with RoomSketcher Home Designer. You can use RoomSketcher to visualize YOUR interior design ideas. Just draw up your floor plan, furnish and decorate and visualize in 3D. It’s that easy! For more interior design ideas, tips and inspiration – check out the recommended posts below.